There’s a lot involved in building an online presence. 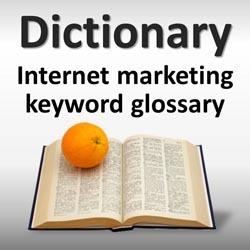 To explain some of the industry jargon, LeadFire offers this dictionary and glossary of internet dental marketing keywords. Affiliate Marketing (Strategic Partnership) – Third party marketing. Affiliates (strategic partners) are paid a commission for marketing and selling a merchant’s product, attracting leads, or increasing website traffic. Blog (web log) – Blogs function as online journals. Most blogs are updated frequently and focus on a general topic, providing a record of company updates, the author’s personal life, news stories on specific topics, etc. Blogs can be hosted by a site such as WordPress, and can have RSS feeds associated with them. Browser (web browser, internet browser) – The software a computer uses to access the internet to view and navigate websites. The most popular web browser programs are currently Microsoft Internet Explorer (IE), Mozilla Firefox (FF), Apple Safari, and Google Chrome. Click-Through – When a user who is shown an online advertisement actually clicks the on ad, ending up on the the advertiser’s offer page. PPC and CPC marketing costs are based on users clicking through. Click Through Rate (CTR) – A way to measure the effectiveness of online advertising. The CTR is equal to the number of clicks on a specific ad divided by the number of impressions (how often that ad is displayed), indicating how often people who see the ad actually click through. Click To Conversion (CTC) (Conversion Rate) – A measurement of how often leads convert. For a dental practice, this would mean the rate at which leads are converted to new dental patients. Calculated by dividing the number of clicks by the number of conversions, the conversion rate is the ultimate metric of success and converting web visitors to leads or customers. Cost Per Acquisition (CPA) – A type of online advertising. In PPC marketing, the advertiser pays each time a user clicks the ad, regardless of the conversion rate. In CPA marketing, the advertiser pays based on a particular action (lead, sale, etc.). Cost Per Click (CPC) – Also called Pay Per Click marketing (PPC), this is a type of web advertising where advertisers pay a fee to the search engine each time someone clicks their ad (often a text ad). The CPC is the amount the advertiser agrees to pay each time someone clicks on their advertisement. The CPC increases when more advertisers are competing for the same keywords. Cost Per Impression (CPM) (Cost Per 1,000 Impressions) – A type of internet marketing where the advertiser pays based on how many impressions their ad receives (i.e., how often the ad is seen by users). Payments are set per 1,000 impressions. Banner ads often use CPM marketing. Directories (Online Directories, Web Directories, Portals) – A website or search engine that provides detailed directory listings. Directory marketing can increase web presence. Domain Name – A website’s overall main address. Domain names often end in .com, .org, .net, etc. Most websites have many web pages associated with their primary domain name. The domain name is the part of the URL after http://www. that can be seen in your browser. Domain Redirects (website forwarding) – When one domain name or URL redirects visitors to another website with a different domain name or URL. This allows multiple domain names to point to a single website. Geo-Targeting – A type of Targeting where marketers specify the geographic areas from which they want leads. Website content can be geo-targeted to include city, town, neighborhood, ZIP code, county, state, and region. Impressions – An online ad receives an impression every time a user views a webpage displaying that ad. Depending on the amount of time the user spends on the page and where the ad is placed on the page, the user may or may not actually notice the ad. Internet Marketing (online marketing, web marketing) – Using the internet to reach new leads, contacts or clients. Methods include Search Engine Optimization (SEO), Search Engine Marketing (SEM), PPC advertising, and Local Search. Keyword (Keyword Phrase, Key Phrase) – The word (or, typically, group of words) that a person enters into a search engine. Keywords are also the words or phrases that are included in web pages or bid on for paid advertisements. Dental marketing keywords often focus on particular types of dentistry. Keyword Optimization: – A search engine optimization technique where specific keywords or phrases are included within a web page to improve search engine positioning for those keywords or phrases. Search engines look for a keyword ration that suggests the page’s content is related but not overstuffed with keywords. A dental website should be optimized for dental marketing keywords. Keyword Tags (Meta Tags) – Tags in the HTML programming code of a web page that define the keywords used on that page. Keyword tags are a type of meta tag; other meta tags include a page’s title and description tags. Though meta tags are somewhat invisible to website visitors, they can affect a page’s search engine positioning. Dental marketing keywords should be included in a dental website’s meta tags. Local Search – Web searches for local services or products. Local searches include keywords based on (1) the service desired and (2) the geographic area. Local search engine optimization involves geotargeting web pages by including geo-location information such as city or town, neighborhood, ZIP code, county, state, or other geographic identifiers. Local Business Listings (Local Search Listings, Local Listings) – In a search engine’s map or local search area, details about businesses are listed in local search results. Listings tend to include the business’s name, phone number, hours, description, and website; many also contain customer reviews and testimonials. Local search sites include Google Maps (previously known as Google Local), Yahoo! Local and Bing Local (previously Windows Live Local, also known as Bing Maps). Long Tail Keyword (Long Tail Keyword Phrases, Long Tail Key Phrases) – Keyword phrases that are less common and include more words than the most common keywords in a particular area. These specific niche keyword phrases tend to be at least four words and are often entered in quotes. Long Tail Keywords can play an important role in search engine marketing. Meta Tags – Tags in the HTML programming code of a web page that describe content on that page. Types of meta tags include keyword tags, page title, page description, and alt tags. Though meta tags are somewhat invisible to website visitors, they can affect a page’s search engine positioning. Mobile Marketing – Marketing that focuses on reaching users through mobile devices like the iPhone, iPad, Android, Blackberry, Treo, and other smart phones. Organic Search Results (Natural Search Results, Natural Results, Organic Results, Natural Listings, Organic Listings) – The results returned by a search engine based on its search algorithm that tries to choose the most relevant and related content. Organic listings are not advertisements, in contrast to Paid Search. Page Rank (Position, Rank) – How high a particular webpage or site appears in search engine results. Google assigns pages a rank from 0 to 10, with priority in search results being given to pages with higher ranking. Many factors play into page ranking, including keywords and incoming links, but search engines closely guard their exact positioning algorithms. Paid Search Listings (Paid Placement) – Paid listings or advertisements returned by a search engine for a particular keyword phrase, usually purchased on a Pay Per Click basis. Paid Search Results are in contrast to Organic Search Results. Pay Per Click (PPC) (Pay-for-Performance) – PPC marketing is the most leading type of search engine advertising. With PPC search engine marketing, advertisers pay the search engine for every time someone clicks on their ad. Return on Investment (ROI) – How much an investment nets compared to its cost. All marketing efforts should generate a positive ROI. Search Engine – A website where people can search the internet – for example, Google, Yahoo!, or Bing. Search engines typically include both Organic Listings and Paid Listings. Search Engine Marketing (SEM) – Online marketing that revolves around search engines. Major tools include SEO (search engine optimization), with the goal of improving placement in keyword search engine results, and paid search such as PPC (Pay Per Click advertising). Search Engine Optimization (SEO) – Methods of increasing search engine position. SEO typically involves targeting particular keywords and keyword phrases. Search engines use complex and secret algorithms to determine page rank, involving content, programming code, and incoming links. Search Engine Reputation Management (SERM) (Online Reputation Management) – Coordinating a person or company’s entire online presence, including websites, SEO, paid search marketing, testimonials, social media, blogs, and online reviews. Reputation management is the key to dealing with negative press or consumer reviews. Search Engine Results Page (SERP) – The page(s) displayed by a search engine when someone searches for a particular keyword phrase. These pages show both organic and paid listings. Search Engine Management (SEM) tries to make a website or ad appear higher up on this page (or set of pages). Search Term – The word or phrase that a person enters into a search engine. Search Terms refer specifically to what users are searching for, not what websites are offering or advertisers are targeting. Social Media – User-generated online content, and websites feature content submitted by users. Social media outlets include social networking websites, blogs, video sharing, wikis, podcasts, etc. Social Networking – Online interactions between users. Social Networking Websites are a type of social media that let users share information with other users, whether for personal or business reasons. Examples of social networking include online profiles at Facebook and LinkedIn, consumer reviews on Yelp and local search, feeds on Twitter, link sharing on Digg, blogs on WordPress, videos and playlists on YouTube, photo sharing on Flickr, and social apps for the iPhone and Android. Strategic Partnership (Affiliate Marketing) – Third party marketing. Strategic partners (affiliates) are paid a commission for marketing and selling a merchant’s product, attracting leads, or increasing website traffic. Targeting – Attracting specific types of visitors, leads, or customers. For example, Geo-Targeting is a method of targeting local patients by including geographic information. Traffic (Website Traffic, Web Traffic, Site Traffic) – The measurement of visitors to a particular web page or website. PPC marketing leads to Paid Traffic, while Search Engine Optimization (SEO) and incoming links encourage Natural Traffic (organic traffic). Universal Search (Blended search) – When a Search Engine Results Page shows multiple types of search results: not just websites, but videos, images, news, and local search results. URL (Universal Resource Locator) – The exact address of any particular web page or other piece of content posted on the internet. The full URL of any web page can be seen in your browser. One domain name may have may web pages, each with its own unique URL. Website (web site, site) – Most websites include multiple web pages. The content on all these pages is part of the website as a whole. Websites are typically identified by their primary domain name. Web Page (page) – A unique page on a website, identified in your web browser by its URL. Most websites have a single domain name but include multiple web pages.